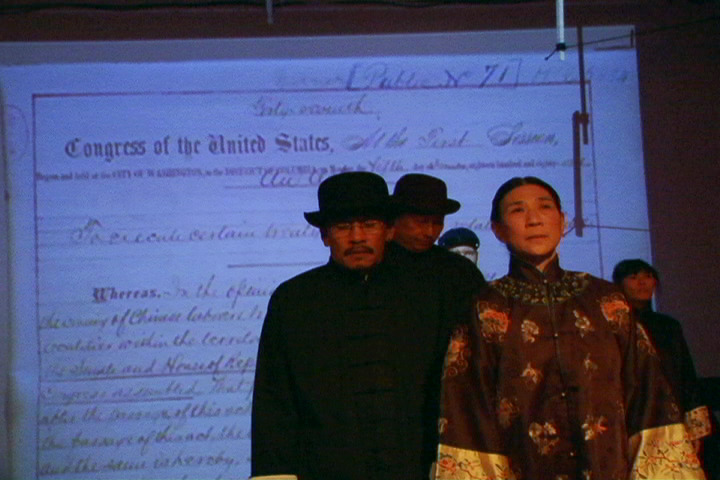 PAPER ANGELS takes place on Angel Island in 1915, and follows a group of Chinese who are detained on Angel Island because of the Chinese Exclusion Act. 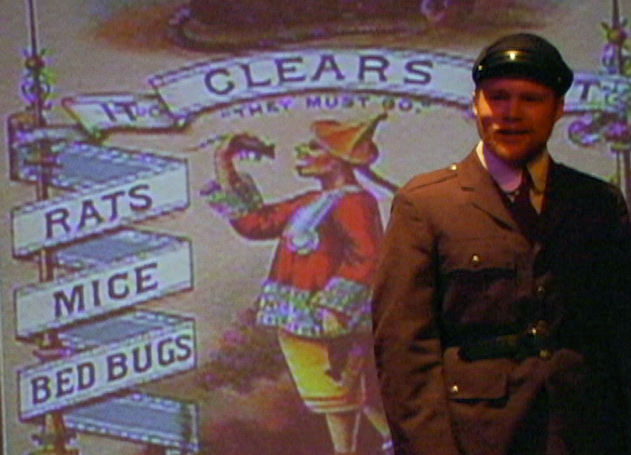 To create the world of the play, we'll be projecting archival images not only of Angel Island, but also of anti-Chinese magazine covers, posters and advertisements that were prevalent in late 1800s and early 1900s. 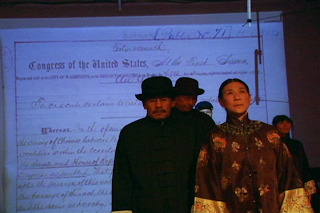 The play begins with photographs of the Chinese coming across the ocean and the Chinese Exclusion Act itself. Enacted in 1882, the Chinese Exclusion Act was the crowning achievement of the anti-Chinese movement, which sought to drive the Chinese out of America by any means possible. The Exclusion Act was not revoked until 1943, when Franklin Roosevelt repealed it to encourage Chinese cooperation in the Allied battle against the Japanese. It's a striking document, with the lovely penmanship of the time, but the language is completely over the top. 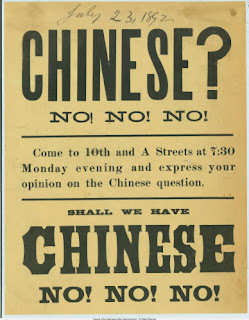 Chinese laborers were barred from coming to American because, "...in the opinion of the Government of the United States the coming of Chinese laborers to this country endangers the good order of certain localities...."
It's hard to believe now that the Chinese are considered the model minority, but from the 1870s to the early 1900s, the West Coast was virulently anti-Chinese. See this blog to learn about quite a few atrocities from that era, including the infamous Rock Springs Massacre. 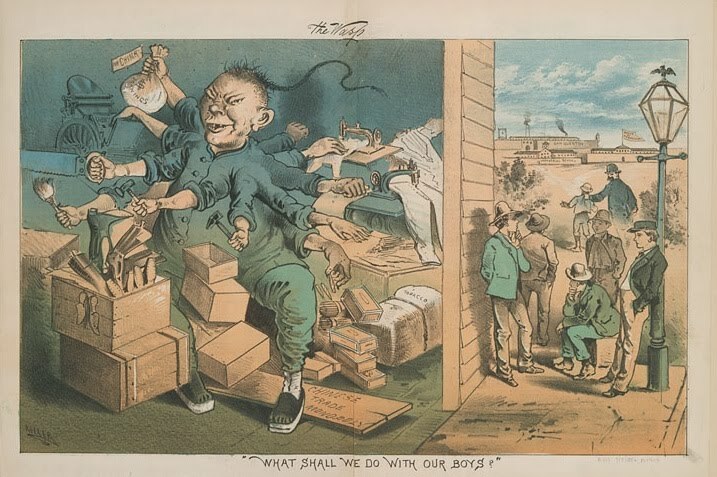 The Chinese were not only reviled as racially inferior, they were also considered a threat for being such cheap labor (the more things change...) In this cartoon from the anti-Chinese San Francisco magazine The Wasp, a buck-toothed, slanty-eyed Chinese Octopus Man puts a group of able-bodied white men out of a job. (Click to view in all its incredible details.) This amazing broadside, which will be the backdrop for Fong's monologue, urges you to come vent on the Chinese Question with CHINESE coming at ya in GIANT type. These negative stereotypes are part of an uncomfortable past that I think it's important to face. It's not likely that a minority in America will face the same drastic open persecution that the Chinese did, but we continually see the same sentiment rearing its ugly head. Maybe by recognizing the outrageousness of this ad in which a Chinese man is about to down a yummy rodent, we'll check our impulses towards racist nationalistic paranoia. Think I'm exaggerating? Read this from the Tea Party. Substitute "Chinese" for "Amnesty" and it may as well have been published in The Wasp.